“It was full moon while I was down at Takaunga, and the beauty of the radiant, still nights was so perfect that the heart bent under ti. You slept with the doors open to the silver Sea; the playing warm breeze in a low whisper swept in a little loose sand, on to the stone floor. One night a row of Arab dhows came along, close to the coast, running noiselessly before the monsoon, a file of brown shadow-sails under the moon.”–to sleep here would be the sleep of dreams. “The grave was a thousand feet higher up than my house, the air was different here, as clear as a glass of water; light sweet winds lifted your hair when you took off your hat; over the peaks of the hills, the clouds came wandering from the East, drew their live shadow over the wide undulating land, and were dissolved and disappeared over the Rift Valley.”–I want to go there and breathe that air. p. 353: Sirunga – I am not sure what this word means. I did find a safari company called Sirunga Safaris. I am guessing that it is a word for Kenya? Does anybody else know? p. 354: “You must turn your mournful ditty, To a merry measure, I will never come for pity, I will come for pleasure.” – “Song” by Percy Bysshe Shelly (1772-1822). From PoemHunter.com. p. 354: disapprobation – the act of dissaproving; condemnation. p.355: Sinbad the Sailor – from Wikipedia. Sinbad the Sailor (also spelled Sindbad; Arabic السندباد البحري as-Sindibād al-Baḥri; Persian سندباد Sændbād) is a fictional sailor from Basrah, living during the Abbasid Caliphate – the hero of a story-cycle of Middle Eastern origin. During his voyages throughout the seas east of Africa and south of Asia, he has fantastic adventures going to magical places, meeting monsters, and encountering supernatural phenomena. p. 357: “I saw grey geese flying over the flatlands, Wild geese vibrant in the high air–Unswerving from horizon to horizon, With their soul stiffened out in their throats. . .” – http://www.karenblixen.com/question110.htmle The citation to this poem can be found at this site. Tom Campbell Black, (December 1899, Brighton, England – 19 September 1936, Liverpool, England) was a famous English aviator. He was the son of Alice Jean McCullough and Hugh Milner Black. He became a world famous aviator when he and C. W. A. Scott won the London to Melbourne Centenary Air Race in 1934. Tom Campbell Black attended Brighton College and the records for the period summer 1915 to summer 1917 indicate that he entered Hampden House, May 1915, was appointed House Prefect, January 1917 and played Second XI Football, 1915 to 1916 and 1916 to 1917. Campbell Black attended Army Class II and entered the RN College at Greenwich and attained a commission in the R.N.A.S. (Naval Air Service). He served first as a pilot in the Naval Air Service and later in the RAF during the Great War, rising to the rank of Captain. Arriving in Africa as a soldier settler in 1922, he joined his brother, Frank Milner Black, who had been stationed as a soldier in Kenya and decommissioned in 1920. Black family history has it that Tom and his brother managed a coffee plantation in British East Africa, in the 1920s. Their farm was between the towns of Rongai and Eldama Ravine, in the Rift Valley, about 110 miles (180 km) northwest of Nairobi. Tom was a noted horseman who was an award-winning show jumper, winning a competition in 1925. He later bred and raised race horses, which remained a passion of his throughout his life. p. 363: Gustav Mohr – I couldn’t find any interesting tidbits on him. p. 363: Hugh Martin – Again. Nothing of note. p. 364: mackintosh – from Wikipedia. 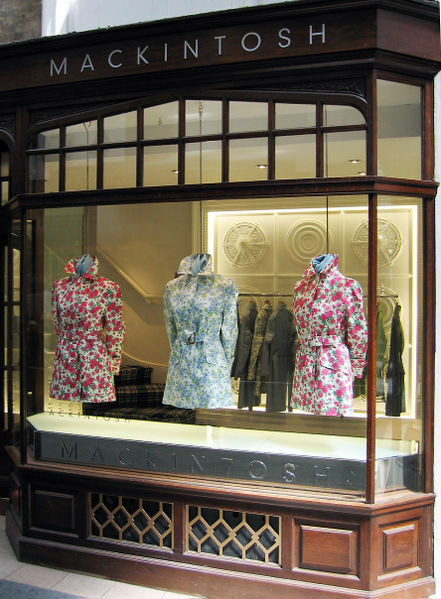 The Mackintosh or Macintosh (abbreviated as mac or mack) is a form of waterproof raincoat, first sold in 1824, made out of rubberised fabric. The Mackintosh is named after its Scottish inventor Charles Macintosh, though a letter k is added by many writers (this variant spelling “Mackintosh” is now standard). Although the Mackintosh style of coat has become generic, a genuine Mackintosh coat should be made from rubberised or rubber laminated material. p. 370: “The Ancient Mariner” – from Wikipedia. The Rime of the Ancient Mariner (originally The Rime of the Ancyent Marinere) is the longest major poem by the English poet Samuel Taylor Coleridge, written in 1797–98 and was published in 1798 in the first edition of Lyrical Ballads. Modern editions use a later revised version printed in 1817 that featured a gloss. Along with other poems in Lyrical Ballads, it was a signal shift to modern poetry and the beginning of British. Romantic literature. 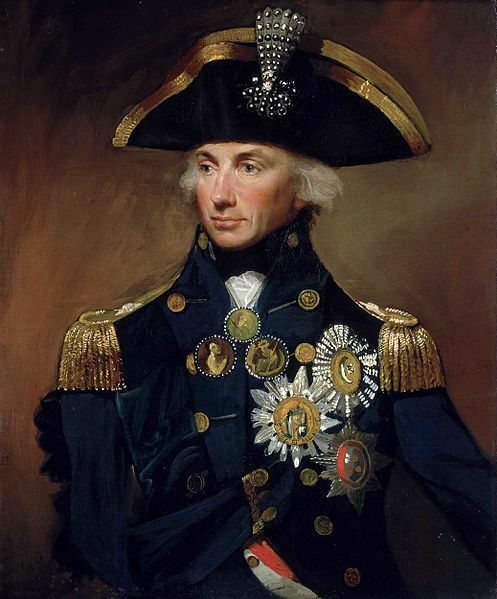 Horatio Nelson, 1st Viscount Nelson, 1st Duke of Bronté, KB (29 September 1758–21 October 1805) was an English flag officer famous for his service in the Royal Navy, particularly during the Napoleonic Wars. He was noted for his inspirational leadership and superb grasp of strategy and unconventional tactics, which resulted in a number of decisive naval victories. He was wounded several times in combat, losing one arm and the sight in one eye. Of his several victories, the best known and notable was the Battle of Trafalgar in 1805, at the end of which he was shot and killed. p. 371: Trafalgar Square – from Wikipedia. Trafalgar Square is a public space and tourist attraction in central London, England, United Kingdom. 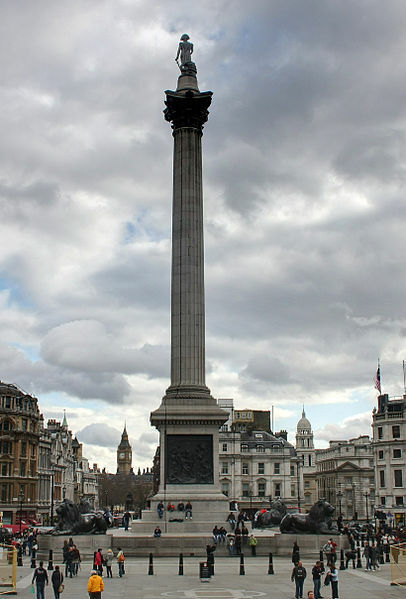 At its centre is Nelson’s Column, which is guarded by four lion statues at its base. There are a number of statues and sculptures in the square, with one plinth displaying changing pieces of contemporary art. The square is also used for political demonstrations and community gatherings, such as the celebration of New Year’s Eve. In the 1820s the Prince Regent engaged the architect John Nash to redevelop the area. Nash cleared the square as part of his Charing Cross Improvement Scheme. The present architecture of the square is due to Sir Charles Barry and was completed in 1845. 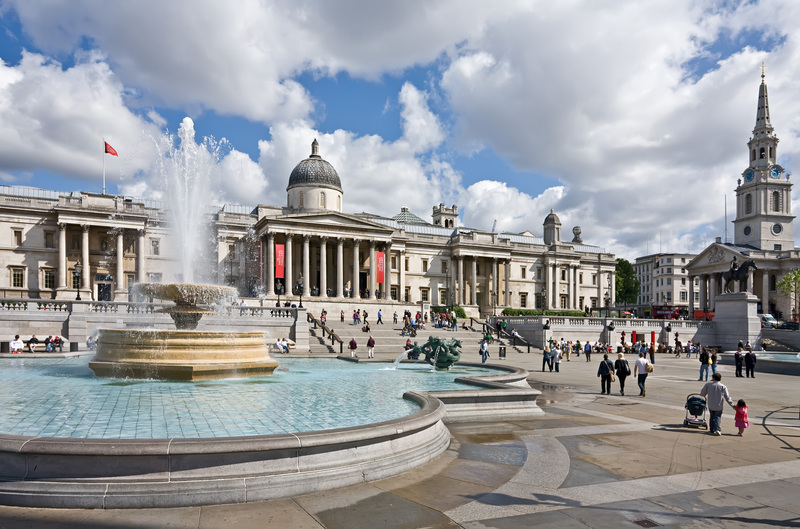 Trafalgar Square is owned by the Queen in Right of the Crown, and managed by the Greater London Authority, while Westminster City Council owns the roads around the square, including the pedestrianised area of the North Terrace. cannot live without Sirunga?’ ‘Yes,’ I said. I think what this means is something like, “Do you mean you can’t bear life without even the least of your Kikuyu, like poor Sirunga, with his epilepsy?” — to which Karen answers Yes.